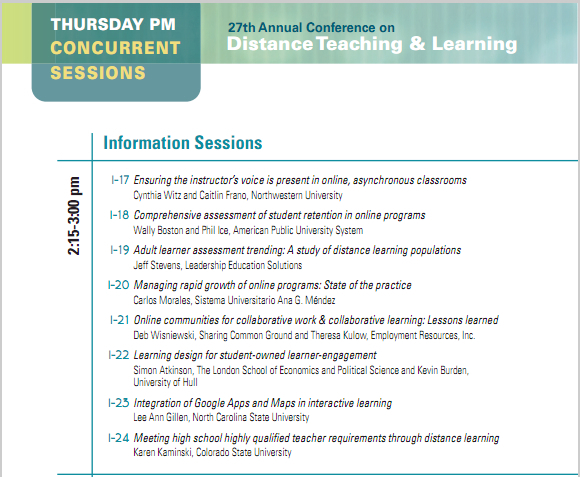 The programme has been releasded for the 27th Annual Distance Learning and Teaching Conference at Madison-Wisconsin this August. It looks like a really fascinating programme and I'm very excited to be part of it. I'll be running a workshop with Kevin Burden on the DiAL-e and details will follow on that (www.dial-e.net) but on the SOLE model front I'm delighted to say that I have two sessions at Madison. 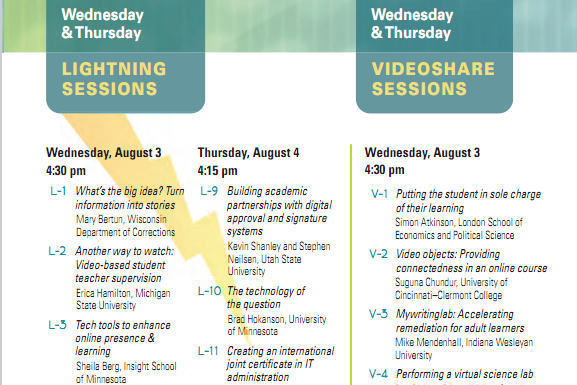 The Videoshare session, which I'll post here immediately afterwards, is V1 on Wednesday 3rd at 4:30. It's a great looking programme, I'll just have to remember to turn up to my own session! There doesn't appear to be a conference hashtag# but Kevin and I will be using #dialeUS for our workshop and I intend using #SOLE2011 for my sessions.